X JAPAN NORTH AMERICAN TOUR ANNOUNCED. 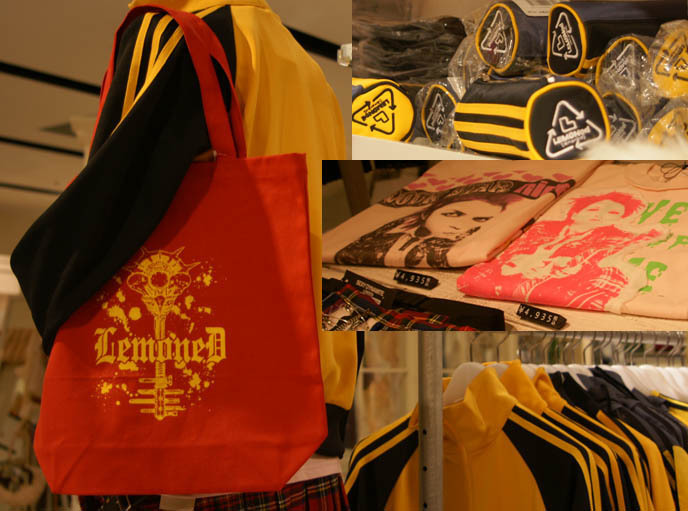 HIDE IS ALIVE: MEMORIAL MERCHANDISE AT MARUI ONE SHINJUKU, HIDE'S LEMONED SHOP IN TOKYO. 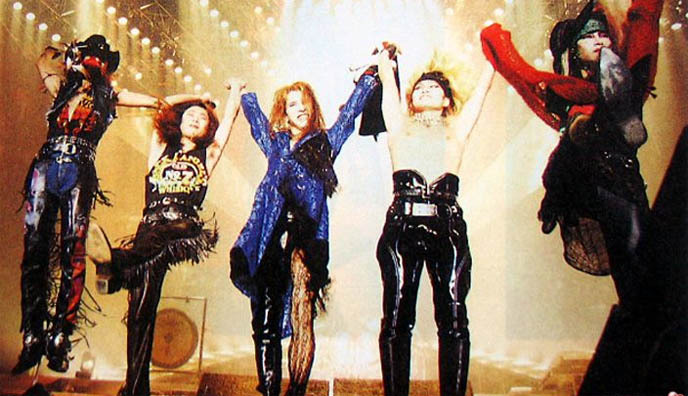 X Japan has been around since the dark ages (ok, they formed in 1982). Guitarist Hide (pronounced Hee-deh) tragically passed away in 1998 — thirteen years ago! But the band lives on, and is now finding new fans outside Japan. 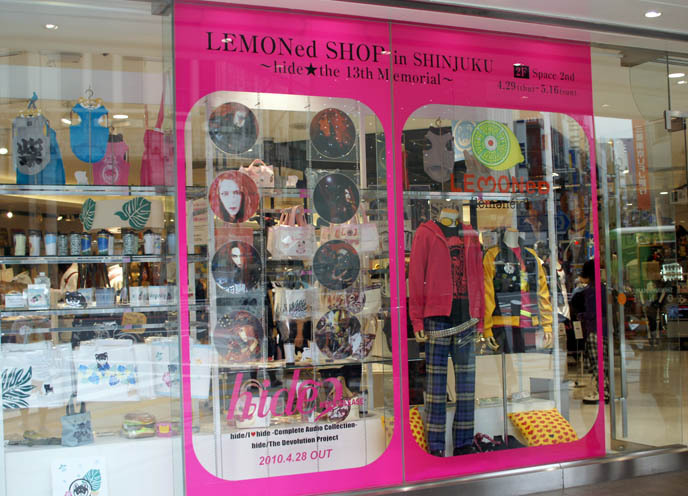 This spring, Marui One Shinjuku set up a special Lemoned Shop to commemorate Hide. 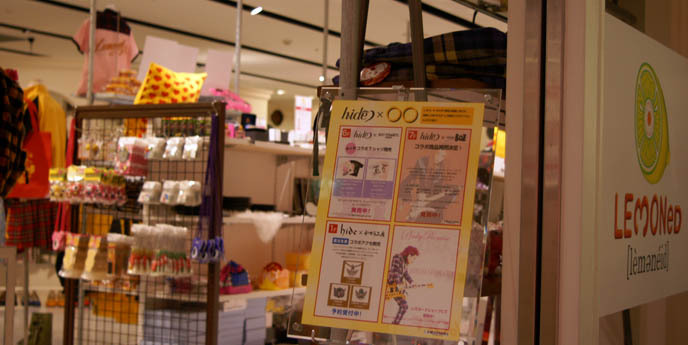 In addition to selling Hide merchandise, the store displayed the legend’s guitars such as the one played in Endless Rain. 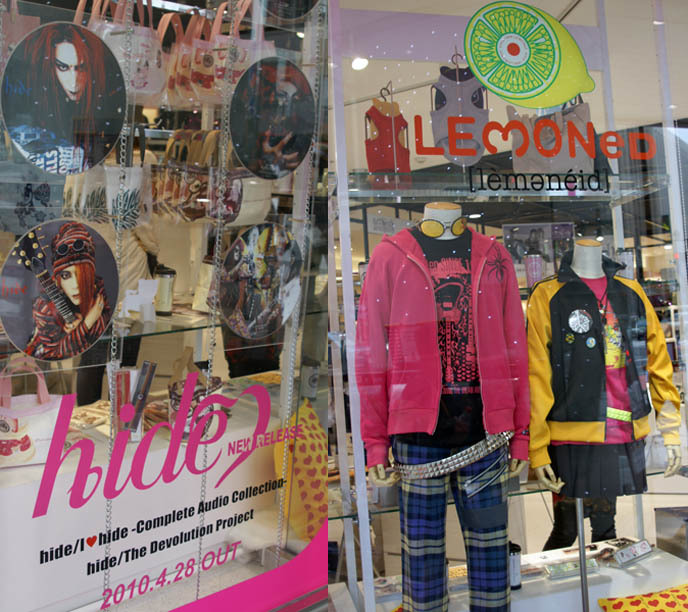 While this was only a month-long special exhibit, you can always visit Hide’s Lemoned Shop in Harajuku, which sells goodies with a slightly worn or malformed aspect (hence the name “lemoned”). 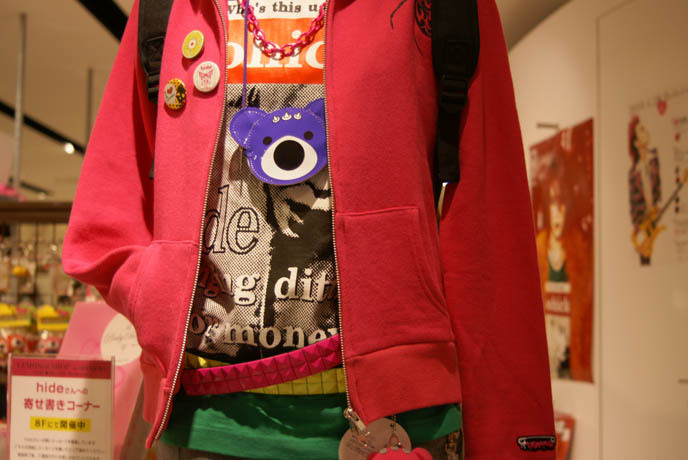 The boutique was also once Hide’s headquarters for his radio station, record label and tireless creative enterprises. The logo — a bright, juicy lemon sliced in half — perfectly reflects Hide’s electric hair and showmanship. Break out the… yen, if you want one of these rare Hide vinyls. 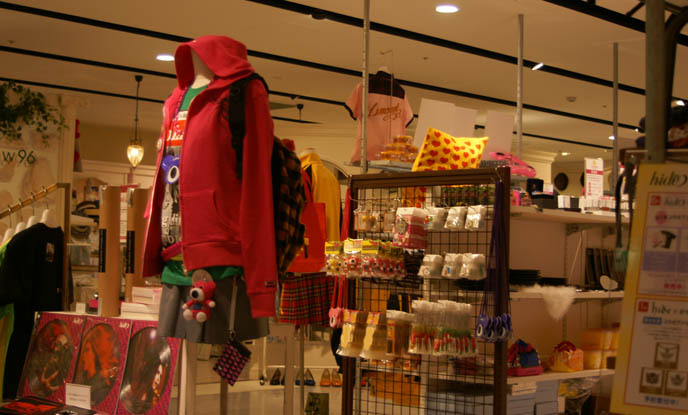 Fortunately, there are also affordable and cute little goodies for sale. 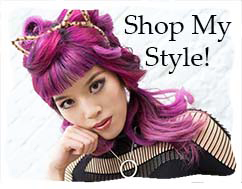 Hoodies, t-shirts, pins, accessories, notebooks and kawaii bears. Perfect souvenirs. Hide is alive… and on a t-shirt. Pick one up from the Harajuku shop if you find yourself in Tokyo. We saw Kaya’s manly look… now let’s marvel at Yukiro’s! He was the model for Sembl’s new collection of Japanese deconstructed high-end mens clothing. (You can see the photos here.) The artsy video above was shot at Mt Fuji; poor Yukiro had to stumble around in icy water while chased by a shinigami (death god). Are you looking forward to X Japan’s first “new” album in 14 years, to be released later this year? Will you be seeing them live? yes!!!! of course I’ll be seeing X live!! X X X X !!! 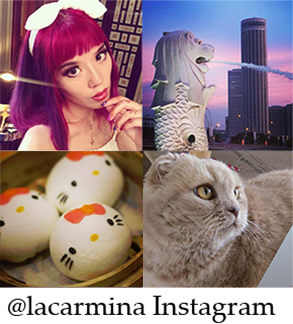 The constant cashing in on hide is obnoxious at the least, offensive at the worst. X Japan hired a new guitarist, they need to just let him play instead of playing hide recordings. People go to concerts to see live music. Also, hide only released 3 albums, there’s no real reason for it to all be re-released every year other than a cash grab. I’m going to Lollapalooza just to see X! I really wish they would hurry up with the new cd though! “!! My dad mentioned he might be doing stuff for them! really??? Do they need a photographer in the US??? if they do I’m happy to help!!! yes!!!! of course I'll be seeing X live!! The constant cashing in on hide is obnoxious at the least, offensive at the worst. X Japan hired a new guitarist, they need to just let him play instead of playing hide recordings. People go to concerts to see live music. Also, hide only released 3 albums, there's no real reason for it to all be re-released every year other than a cash grab. I'm going to Lollapalooza just to see X! I really wish they would hurry up with the new cd though! really??? Do they need a photographer in the US??? if they do I'm happy to help!!! I plan on writing about the whole album later at my music blog. 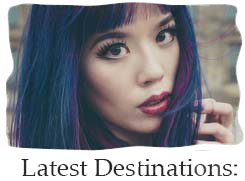 I really liked the song when went there via your twitter feed, so much so, D/L the release. The timing was perfect for a music project I am contributing to so I wrote one of my longest posts about the song.